St Ambrose is drawn from Chapter Three, beginning on page 94, of Volume Four, Darkness Descends of the twelve-volume historical series The Christians: Their First Two Thousand Years. If you would like to order this book please visit www.TheChristians.info. 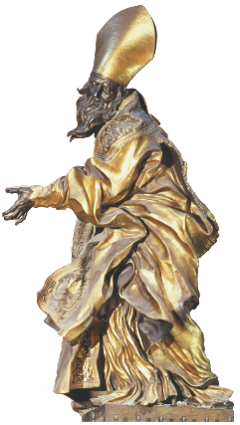 This gilt statue of St. Ambrose, a man numbered among the highly revered “doctors” (theological fathers) of the western church along with Augustine, Jerome and Gregory the Great, stands beside the great throne of St. Peter’s Basilica, Rome. On that momentous fall day in the year 374, the cathedral of the imperial city of Milan was packed with excited and determined Christians, there to elect a new bishop. Auxentius, the clever and influential Arian who had ruled the diocese for two decades, had died. A successor had to be chosen, and other bishops of the region, both orthodox Christian and Arian, were seated at the front of the church. Both parties were also well represented among the increasingly restive townspeople crowding into its nave, and both were determined to replace Auxentius with one of their own. The debate soon turned ugly, and rioting seemed imminent until a stocky, black-bearded man with an authoritative manner pushed his way forward. He was Aurelius Ambrosius, governor of Aemilia-Liguria, whose headquarters were in Milan, and who had anticipated just such a disturbance. Ambrose was orthodox Christian, but well respected by Arians as well, and his words began to calm the mob. Just then, so the story goes, the shrill voice of a child cut through the tumult. “Ambrose bishop!” it cried, whereupon the entire crowd began chanting, “Let Ambrose be bishop,” and would not be silenced. Thus it was that Ambrose, a member of a senatorial family and a career bureaucrat, became a kind of instant bishop, to his own astonishment and chagrin. Not quite instant, of course. The other bishops had to formally acquiesce in this popular decision, and they did. Courtesy and prudence also dictated that Emperor Valentinian I be informed as well, and he, too, approved. In fact, writes the historian Rufinus of Aquileia, the emperor practically ordered Ambrose to accept. Twentieth-century detractors doubted Ambrose’s fabled reluctance, and impugned his motives in finally accepting. But the job of a bishop in the contentious fourth century was no sinecure, not nearly as attractive as the government post Ambrose already held, and would also require him to remain single. In any case, his exemplary subsequent life favors the most obvious explanation for his change of heart: He sincerely believed that, like it or not, he was called by God. His childhood tutor, Simplicianus, a scholar and presbyter and later a bishop himself, put him through a hasty preparation for baptism and consecration. (Many upper-class men in the fourth century remained catechumens because baptism carried with it so many obligations.) He was baptized on Sunday, November 30, 374, and consecrated bishop a week later. After that, writes the Italian historian Angelo Paredi in Saint Ambrose: His Life and Times (Notre Dame, Ind., 1964), one of his first official acts was to turn over most of his personal fortune to the church, to benefit the poor. It was probably a substantial fortune. The Ambrosii were a minor but well-connected senatorial family. His father, who died when Ambrose was a boy, was administrator of the Praeterian Prefecture of the Gauls.2 His widowed mother moved the family from Trier to Rome, where Ambrose and his older brother, Satyrus, received a typical Roman education in the masterpieces of Greek and Latin literature, as well as dialectic, rhetoric, and jurisprudence. It was a devout family, too. A great-aunt had been martyred under Diocletian, and Ambrose’s sister Marcellina had been consecrated a virgin by Pope Liberius in 353. He had been appointed governor about 370, an excellent apprenticeship for administering a diocese that covered most of northern Italy. As bishop, he used the church’s accumulating wealth to alleviate need in a society where other succor was signally lacking. He made good use of ecclesiastical prerogatives to rescue individuals enmeshed in the legal system. And once, to ransom captives, he even proposed melting down church vessels. Equally impressive were his dealings with the three emperors who followed Valentinian I. For the youthful Gratian, he was a spiritual father and an earthly inspiration. “The military eagles and the flight of birds no longer guide your armies,” he told Gratian, “they march in the name of your Lord, Jesus Christ, and in the name of your loyalty to him!” When Gratian asked to be baptized, Ambrose wrote for his instruction a work he titled On the Holy Spirit. For Gratian’s half brother, Valentinian II, the renowned bishop was a familiar childhood figure, a sometime protector and diplomatic courier, and a potent influence despite the antipathy of the boy’s mother, who favored the Arian cause. But Ambrose’s most significant relationship was unquestionably with the emperor Theodosius, where he alternated between ecclesiastical autocrat and spiritual father as the situation demanded. They were well-matched: the despotic emperor contending with his sensitive conscience; and the bishop contending, no doubt, with demons of his own. Then too, both were skillful negotiators when conciliation was called for, and both were implacable adversaries when they believed it was not. As allies in the fight against Arianism, they pursued the eradication, in the west, of that persistent heresy. Nor did it expire gently, thanks in no small measure to Justina, second wife of Valentinian I, a forceful Sicilian of strong Arian convictions. After her husband’s death, Justina filled the court at Milan with Arians and Arian sympathizers and vigorously promoted their cause. Her campaign to acquire Milan’s Portian Basilica for Arian worship, for example, went on for almost a year. At length came a final confrontation on Palm Sunday in 386. This was an imperial ultimatum to Ambrose: Relinquish the basilica or leave Milan. When he refused to do either, soldiers blockaded him all night in the church, together with a large and agitated congregation. He reportedly reassured them by having them sing psalms and hymns, perhaps Christianity’s first historically recorded extemporaneous hymn-sing.4 In the end, the troops were inexplicably withdrawn, and no more was heard about expelling Bishop Ambrose. The fighting bishop must equally be credited with furthering the demise of Roman paganism. He seems uniquely qualified for that job, embodying as he did the best of classic Roman morality, then in sad decline, and the fervor and faith of Christianity. His opposition to pagan ritual was absolutely uncompromising, perhaps because he so thoroughly understood its implications (and this although the leader of the pagan party, Symmachus, was actually a distant kinsman). But Ambrose maintained a clear distinction between pagan worship and Greek and Latin philosophy, whose truths he helped incorporate into the new Christian world. All this he accomplished in an episcopate of just twenty-three years. Historian W. H. C. Frend, in The Rise of Christianity (Philadelphia, 1984), calls him “incomparably the most influential cleric in the west.” As he lay ill in the spring of 397, the powerful general Stilicho, fearing that without Ambrose Italy was doomed, begged him to pray for longer life. “I have not lived among you in such a way that I would be ashamed to live longer,” Ambrose replied, “but neither do I fear to die, since we have a good Lord.” He died that Good Friday, two years after his friend and adversary Theodosius, and was buried beneath the altar of his basilica. All rights for this article on St Ambrose are owned by the Society to Record and Explore Christian History (SEARCH). In accessing this page on St Ambrose you agree to only download the content for your own personal non-commercial use.